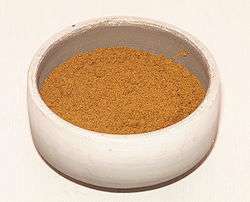 Ras el hanout or Rass el hanout (Arabic: رأس الحانوت‎‎ raʾs al-ḥānūt, pronounced [rɑʔs ælħɑːnuːt]) is a spice mix from North Africa. It plays a similar role in North African cuisine as garam masala does in Indian cuisine. The name is Arabic for "head of the shop" (similar to the English expression "top-shelf") and implies a mixture of the best spices the seller has to offer. Ras el hanout is used in many savory dishes, sometimes rubbed on meat or fish, or stirred into couscous or rice. The mix is generally associated with Morocco, although neighboring North African countries use it as well. There is no definitive composition of spices that makes up ras el hanout. Each shop, company, or family may have their own blend. The mixture usually consists of over a dozen spices, in different proportions, although some purists insist that it must contain exactly 12 items. Commonly used ingredients include cardamom, cumin, clove, cinnamon, nutmeg, mace, allspice, dry ginger, chili peppers, coriander seed, peppercorn, sweet and hot paprika, fenugreek, and dry turmeric. Some spices may be particular to the region, such as ash berries, chufa, grains of paradise, orris root, monk's pepper, cubebs, dried rosebud, fennel seed or aniseed, galangal, long pepper. Ingredients may be toasted before being ground or pounded in a mortar and mixed together. Some preparations include salt or sugar, but that is generally not the accepted practice. Garlic, saffron, nuts or dry herbs are generally not included, as they are usually added to dishes individually, but some commercial preparations, particularly in Europe and North America, may contain them. The composition of ras el hanout differs somewhat from the Baharat spice mix, but they differ more by the types of dishes they are associated with and by region rather than the ingredients in them. Although used by Berber people, it should not be confused with "berbere" spice mix from Ethiopia. In the past, ras el hanout sometimes included cantharides in its ingredients, for its aphrodisiac properties, but the sale of cantharides was banned in Morocco in the 1990s. ↑ Raghaven, Shusheela (2000), Handbook of Spices, Seasonings and Flavorings, 2nd Ed. P 284-285. CRC Press, Taylor and Francis Group, ISBN 0-8493-2842-X. ↑ Davidson, Alan (1999), The Oxford Companion to Food, Oxford University Press, ISBN 0-19-211579-0. This article is issued from Wikipedia - version of the 8/3/2016. The text is available under the Creative Commons Attribution/Share Alike but additional terms may apply for the media files.